This planetary nebula is in Cassiopeia. 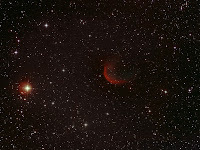 Designated as Sharpless 2-188, the nearby bright star is HD 9352. I never thought the sky was going to clear properly and was on the verge of giving up when it suddenly improved and I was able to get 10 fairly good subs between some patches of cloud. It keeps surprising me just how many relatively unknown objects are now worth attempting when the sky is obliging. 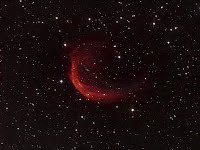 Details: 10" F.4.3 Newtonian 10x 10 minute exposures @ iso800 with CLS in DSS, Photobrush & XAT.